Home > Trends > Bollywood’s Obsession for Muted Hues & Whites is a Trend You Can’t Miss! Bollywood’s Obsession for Muted Hues & Whites is a Trend You Can’t Miss! A new fashion wave seems to have hit the B-town. Celebrities and Bollywood divas can often be spotted in light, muted hues – a look they have been carrying almost everywhere, be it the elusive red carpet – or the trendy airport looks. Whether this is to do with the soaring temperatures – or it’s just an inclination towards the soothing vibes of the subtle colour palette of whites, creams and tones of beige – this love for light, ethereal hues surely is endearing. We’ve spotted these trendsetters sizzling, playing it cool with neutrals at various places – from ever-glam parties to award ceremonies – and we sure want to catch up on this trend. These days, airports are no less than a fashion runway! Every other day we see airports buzzing with shutterbugs and paparazzi to capture the runway look of celebrities. Slender beauty Vaani Kapoor, wooed us with her simplicity in this creamy grey hued plain trousers suit donned for one of her recent trips. Well, isn’t that a comfortably stylish travel look? And yes extra points for that dazzling smile! I was wondering if I should pick a similar plain pair of trousers or palazzo suit for my next trip. A cotton suit would work well for the ongoing summer, and then, you can always add on a pair of trendy glares and other add-ons handy to style your plain outfit. Glam-packaging is, after all, the order of the day! The ruling heartthrob and an undisputed fashion empress, Deepika Padukone floored the audiences by walking the red carpet for the Hello Hall Of Fame Awards 2018 in a stunning all-white, eclectic white gown. Detailed, with a risque neckline, statement balloon sleeves and an extended hemline, the outfit only added more points to her glamorous image. Whether it’s a bandage gown or a purely traditional saree, Deepika never fails to look speechlessly splendid! She was awarded the ‘Entertainer of the Year’ in the female category at the said awards ceremony. Director Divya Khosla Kumar, who is known for her enchanting dimples and sparklingly beautiful eyes, sported a white striped skirt paired with a white Tee at a recently held Bollywood bash. The elegant, doe-eyed lady looked every bit a teenage doll in her pleasingly casual attire. 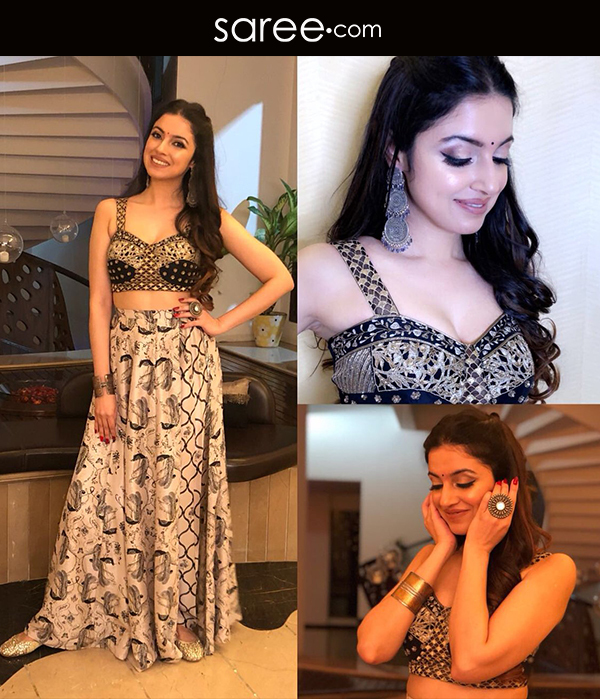 Divya was also seen in a fusion lehenga choli in neutral and grey tones at an awards function in Delhi. Adorable, isn’t she? Wondering how to cop this look? 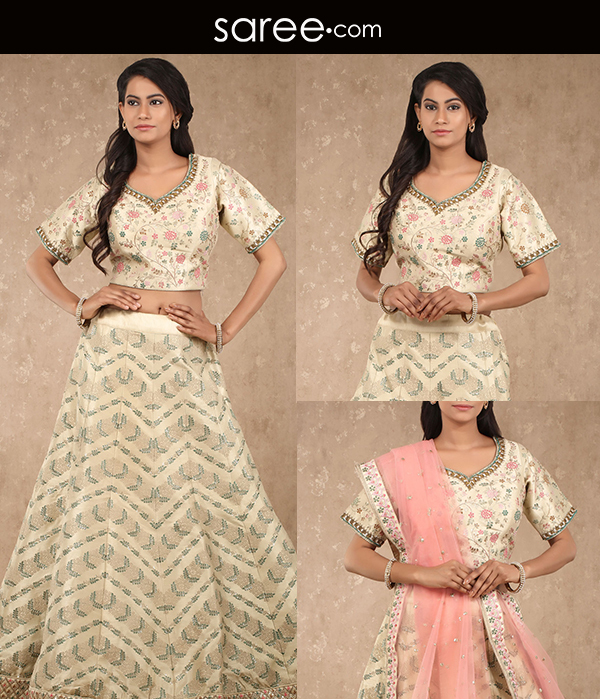 Next time, you head to a day wedding, or dress up as a lovely bridesmaid, choose a white or cream lehenga choli – with matching coordinated lehenga and choli – and dupatta in a different color. Keep the styling subtle, hair flowing open and add a dazzling smile – and you are good to go! While her comedy flicks have been striking a chord with the urban youth of India, actress Nushrat Bharucha has been lately getting into the core fashion circle of Bollywood. At the success party of her recent movie, she surely played her fashion game on point in a dreamy white, halter neck evening gown. On her well-toned frame, coupled with loads of confidence – she sure pulled this look ten-on-ten! Oh, how could we leave behind the gorgeous Kapoor sisters? When it comes to fashion and styling, these charming beauties know how to make a lasting impact! Kareena’s red carpet look in a plain off-white bell sleeved blazer set was absolutely stunning! She’s an evergreen sweetheart after all! 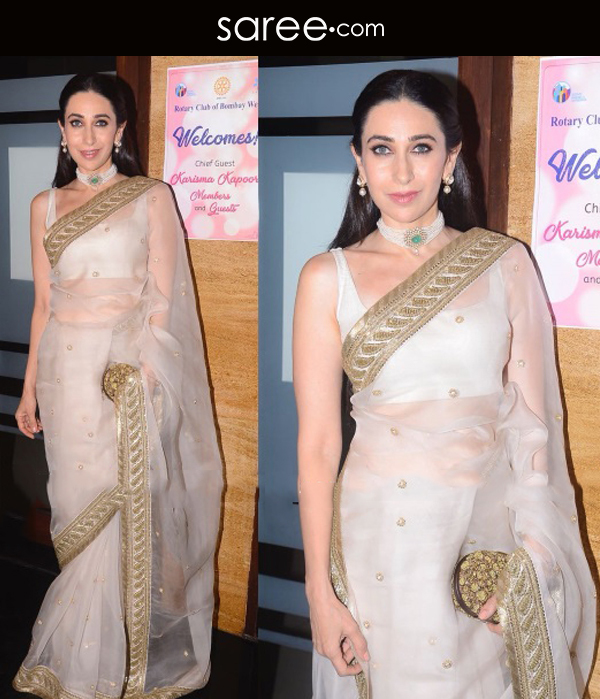 While the younger one slayed it in a western ensemble, the elder princess Karisma Kapoor graced a Women’s Day social event looking every bit of an Indian goddess in a cream saree edged with a golden lace border. Regal yet minimalistic pearl jewellery made a smart add-on to her adorably simple desi look! We somehow can’t get over the day-to-day social media updates of these two lovely sisters. Aren’t they looking cute in these blue and white palazzo suits? 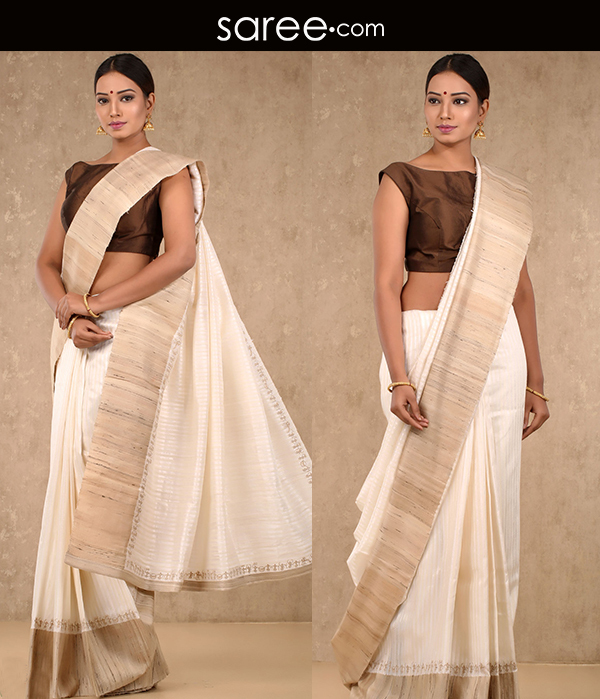 You too can cop this perfect-for-summers look with easy-breezy palazzo suits and cotton/ silk-cotton sarees – in beige, off-white and white palette. The hues are not only cool and soothing, but also are very elegant and classy for formal, office and corporate wear. What’s more! 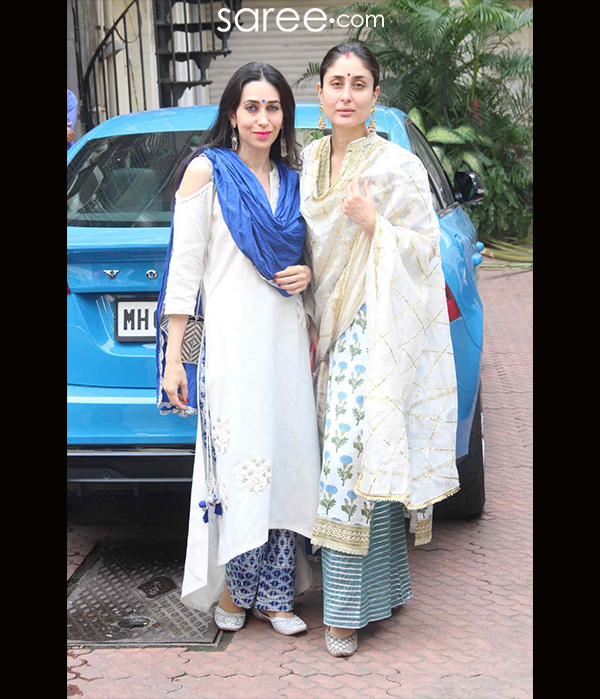 You can dress up your simple cream palazzo suit like the Kapoor sisters – with colorful Bandhani dupattas, jhumkas and loads of silver jewelry and pull this soft, dreamy look for festive occasions too. So it seems that the neutral bug is biting the whole of Bollywood! As always, we can expect the trend to be emulated by fans across the globe. Well with summer hovering over stronger with each passing day, we can look forward to playing the fashion game of neutrals at every place and every point of time! 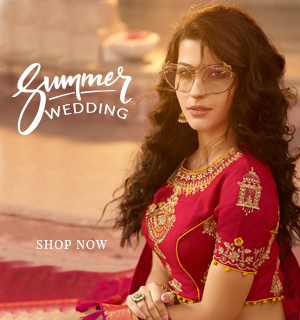 13 Indo-Western and other Fusion trends – Why you can’t miss out on this? Television’s Favourite Vamp Svetlana Will Have You Pleasantly Surprised With Real Avatar. 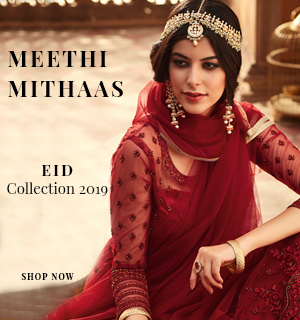 7 Ways you can slay Indian Ethnic Suits…. Latest Party Wear Saree Trends, you got to hack from these Bollywood beauties! 6 Saree Secrets to Look Slim – Without Actually Losing Weight!